YU Televentures, the Indian smartphone brand has been successful in competing against the likes of Chinese brands like Xiaomi and Lenovo over the online sales. While the sales aren’t that huge but that doesn’t matter for YU, which is not even a year old company. Until now the company had launched four smartphones, and all of them are priced under Rs. 10,000 price range. 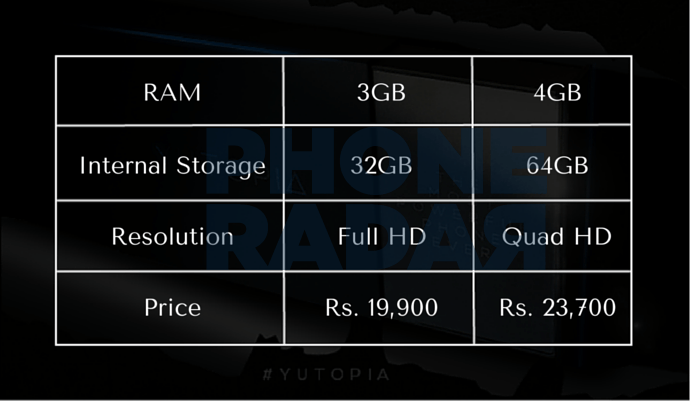 A couple of months back few specifications of the Yutopia had been leaked, thanks to the Zauba listing. It comes with a 5.2-inch display, and there will be no MicroSD card slot for storage expansion. Recently the company had been teasing the launch of Yutopia by tweeting few images, as per the tweets we expect the device to sport a Quad HD display, 32GB of built-in storage, metal body, and Quick Charge support. As per the insider source from YU, the device will be launched in two variants, and both of them will be powered by Snapdragon 810 octa-core processor. While the first variant comes with Full HD resolution display and has 3GB of RAM; the second variant will be of Quad HD resolution along with 4GB of RAM. Coming to the price, the 3GB variant will be priced at Rs. 19,990 while the 4GB RAM variant costs Rs. 23,700. With such an aggressive pricing, both the variants will be first of its kind devices in the smartphone world. Until now, the OnePlus 2 priced at Rs. 24,999 is the most affordable smartphone powered by Snapdragon 810. While the device was initially planned to launch in the last month, the reason for the delay is the over-heating issue of Snapdragon 810. As we earlier mentioned, the Snapdragon 810 powered devices like Xperia Z5 that hit 51 degrees had faced a lot of criticism over the heating issues, the metal body of the Yutopia could be an additional reason for the delays because of the heating issues. We are expecting the device to be powered by the underclocked Snapdragon 810. We have also heard that the device would be coming with an Invite system on the same lines of OnePlus where you get few additional invites once you buy a device. History has shown that the invite system is clearly something most consumers hate because they have to keep waiting or spam their friends or worst even beg or buy these invites from others. Let’s hope Yu Televentures does not make this mistake of keeping an invite system for purchasing their next devices, but only time can tell what’s coming. Stay Tuned.